Ha Ji Won unnie..sarange..I'm so happy for your S7..it's blockbuster! I was so afraid if this film doesn't hit as a news saying that the script is so bad. Congratz unnie! The hugely anticipated "Sector 7" snatches number one this week as it sees some 1,154,158 admissions in its opening weekend. Truly massive numbers for its first week and its success is likely to challenge Korea's top films of the year as its stay on the charts is all but guaranteed for the next few weeks. 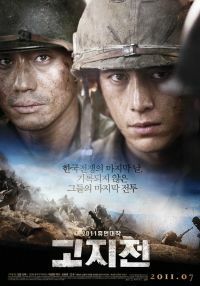 The comedy action film "Quick" holds as number two, managing to trump the war drama "The Front Line". "Quick" has not impressed the critics but has cashed in on the summer rush at the cinemas, earning 368,156 admissions this past weekend. All other films took a hit in admissions this week but "Quick" and "The Front Line" still managed a respectable following. 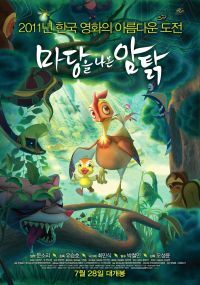 Even the Korean animation "Leafie, A Hen Into The Wild" saw more gains, being able to not only jump up a place but also see its ticket sales raise in the shadow of "Sector 7". Leafie needs to reach 1.5 million admissions to break even but is still currently the best-selling Korean animation ever. 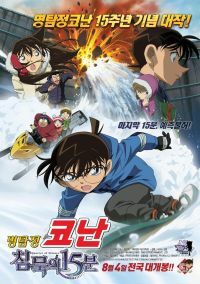 The number five film is the Japanese animation "Detective Conan: Quarter of Silence", illustrating that the young ones still have a say in the rankings. With 223,263 admissions, the Japanese sensation was almost able to undo Leafie in this week's chart. 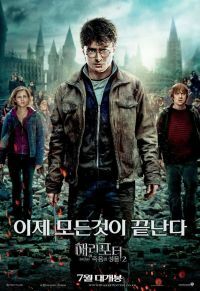 Following is Mr. Potter and company in "Harry Potter and the Deathly Hallows: Part II" pushing its numbers to a total of 4,236,141 admissions as fans rush to enjoy the final chapter in the wizards journey of becoming. "Rio" falls just short of thousand admissions, marking the step decline in this week's numbers. 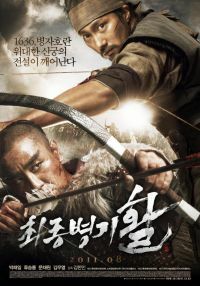 Kim Han-min's historical action film "Arrow, The Ultimate Weapon" is at eight, seeing 77,153 tickets sold as it makes its entrance into this highly competitive Korean line up. As does "Ghastly" by Ko Seok-jin in directorial début, struggling to compete with just 53,285. Lastly, "Captain America" is bullied all the way to ten with a poultry 496,818 total admissions. The first Korean 3D film "Sector 7" pulled more than 1.5 million viewers in only five days despite mixed reviews. 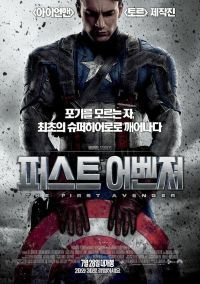 According to data compiled by the Korean Film Council, it lured 142,612 moviegoers nationwide on Monday, taking the no. 1 spot at the box office and bringing the total to over 1.5 million viewers. Earlier, it set a record for attracting 1 million moviegoers in three days, the shortest time for a Korean film released this year. "The Host" achieved the feat in only two days in 2006, the shortest in Korean film history. The industry attributes the success of "Sector 7" to curiosity about the film itself and star Ha Ji-won's comeback to the screen. Watched "Sector 7" on the movie's opening day here in South Korea. While I didn't expect much from the movie, I found myself enjoying the campiness of the movie and the novelty of watching a 3D action monster movie on a huge screen. Without a doubt the storyline is half-baked and I expected that. The movie's forte is the action, special f/x and the 3D presentation. It also doesn't hurt to have Ha Ji-Won in the leading role. If you are familiar with the video games like "Quake" or "Doom" and you know how shallow the storyline is in those games, well "Sector 7" follows the exact same path (even a lot of the movie's visuals looks like something out of Quake). I read that the movie was shot in 2D and later converted to 3D. While watching the movie, I noticed how some scenes looked 2D and the next scene the 3D would be extremely noticeable - kind of like in Photoshop when you wrap a layer mask around part of the image to implement a special filter. The lack of field of depth felt kind of weird in this regard, but I still enjoyed the visuals. Reviews for "Sector 7" has been largely negative so far in South Korea, mostly ragging on the movie's weak storyline and the overt similarities to the Hollywood film "Alien'. For those complaining about the weak storyline, I think that's a lot like someone buying an issue of Hustler magazine and then complaining about the shallowness of the articles (e.g. duh). "Sector 7" is all about the action, special effects, and 3D! I did enjoy the movie for these reasons and the unexpected campiness of the film. I had a fun time watching the movie and that's ultimately what its all about. Anybody that decides to watch "Sector 7" in 2D (either in the cinemas or on DVD) may miss out on those aspects and probably wonder what the hell I'm talking about. Here's a pic of the spiffy 3D glasses they handed out for the movie. Ha Ji-won "Thanks for supporting 'Sector 7'"
[star Date] Ha Ji-won, An Seong-ki, Oh Ji-ho, and Park Cheol-min - Cast of movie "Sector 7"
below is the BTSs of sector 7, but u have to watch it in IE.. at least I had to. My mozilla cannot support this. So, u can see for urselves when ASG said they worked together really well.. and full of laughters too.. I watched the movie today. I'm not that hard to please, but this movie...honestly, it was pretty... bad. I went in with super low expectations, and got what I expected. If I had high expectations... mann... I would have been so disappointed. I laughed at parts when I probably shouldn't have. The one surprise was Ha Ji Won. Ha Ji Won felt awkward in the role as the bada** female. I really like her, but her acting in this movie was very mediocre. Oh Ji Ho was... useless. I didn't really understand what his purpose was other than to aid in showing that Ha Ji Won's character is skilled with the motorcycle. Oh Ji Ho and Ha Ji Won are supposedly lovers, but uhh...sure. I didn't mind the other actors (pretty whatever characters and Park Chul Min continues to be too OTT. The screaming and yelling by (just about) all the characters got annoying after some time. I understand during a crisis, one might be inclined to scream, but STILL.. there was just so much of it. Then again, maybe I was already bored of the movie by then. The monster got annoying instead of being scary. The movie felt too by-the-numbers in my opinion. I could easily predict (for the most part) when someone would die. The CG was too noticeable and distracting especially in the beginning. I couldn't connect with most (if not all) the characters. The only person I felt sad to see die was the youngest member because well... he was cute (shallow, but that's just how unconnected I felt with the characters). It seemed like it could be a decent summer blockbuster from its promotional stills/trailers/etc especially with the cast, but it turned out to be very poor. There's a fair amount of gore/disgusting things/etc, and my friend had trouble digesting it all (Personally, I don't mind). Even if blockbusters are not meant to really have any substance, this was still pretty mediocre for a summer blockbuster. If you're really TRULY in the mood for some mindless MINDLESS entertainment, you should watch the movie. If not, I don't think it's worth the price of the movie tickets, popcorn, and drinks. I hope this quickie review (though very amateurish) was helpful in any way. If there's anyone out there that had this movie as a MUST WATCH NO MATTER WHAT, go ahead. I think forming one's own opinion is just as important as reading/understanding others' opinions. btw that glow-in-the-dark fish thing is adorable! It comes out so tiny in the movie, so I couldn't really tell. Sector 7 English Soft-Sub Subtitle is out. I find myself agreeing with sPark, no matter how unwilling I might be to admit that since I really really really like Ha Ji Won hahaha. Box office wise I think this movie stopped somewhere around the 2 million viewers mark, though they did sell distribution rights to 40+ countries I believe. This movie had the potential to be better, with better directing and editing, since they did have a solid cast. Oh well I hope that HJW's next 2 works will be awesome Especially looking forward to Hi, Anna where she's supposed to be a warrior again! Congratulations to Ha Ji Won and the Sector 7 team!!!! A scene from the movie "
The Korean 3D monster movie "Sector 7" became the highest grossing local movie to open in China, its distributor CJ E&M Pictures said Tuesday. The film, about an oil rig crew fighting a bloodthirsty sea creature, brought in over 20 million yuan (US$3.15 Million) after just one week in theaters as of Dec. 14. This beats previous Chinese box office records set by Korean releases. In 2007 the romantic comedy "200 Pounds Beauty" took 16 million yuan while the creature thriller "The Host" earned 14 million yuan. "Sector 7" opened across some 4,000 screens in the neighboring Asian country on Dec. 6 and topped Hollywood franchises such as Spielberg's "The Adventures of Tintin" to rank second in the box office. The film's distributor says that "Sector 7" was widely marketed as Asia's first mega-budget 3D spectacle. The film's heroine Ha Ji-won took part in rigorous promotional tours across Beijing and Shanghai, holding press events and special meetings with fans ahead of its release. "The Chinese press took interest in the fact that a beautiful female character fights to survive against a mysterious monster, and it helped that Ha Ji-won recently became popular in China through the TV series "Secret Garden"," said CJ E&M Pictures. In addition, top Chinese pop star Vision Wei sang the Chinese version of the film's theme song, "Run Away", adding to its publicity. "Though 'Sector 7' did not do very well domestically, it is getting a second chance overseas", said the film's distributor. The 14 billion won project yielded disappointing results in the local box office, attracting just 2.2 million viewers. French and German distributors are looking into prospects of releasing "Sector 7" in Europe, said CJ E&M Pictures. Leading South Korean investor/distributor CJ Entertainment has announced that sci-fi thriller "Sector 7" has become the highest grossing Korean film in China. Released Dec. 6 on approximately 4,000 screens, the sea creature feature took in CNY20 million (US$3.1 million) by Dec. 14. The film opened at no. 2 in its first week. Amongst foreign film releases, it was no. 1 at the box office. Released in China with the title "Shen Hai Zhi Zhan", the film is the first large-scale 3D film from Korea to open in the country. Directed by Kim Ji-hoon, whose other credits include "May 18". The film stars Ha Ji-won("Haeundae"), AHN Sung-ki ("The Divine Weapon"), and Oh Ji-ho ("My Wife Is a Gangster") in a thriller about people on an oil drilling rig who find something more lively than fuel. The film was produced by JK Film and CJ Entertainment. Romantic comedy "200 Pounds Beauty" was the previous holder of the record for top Korean film released in China, with CNY16 million in 2006. Lead actress Ha Ji-won visited China to promote the film Dec. 5 – 7. Audiences had an opportunity to become familiar with her over the years from Korean television series such as "Secret Garden". The film also saw active online marketing, and gathered approximately 145,000 followers on Weibo, the Chinese equivalent of Twitter. Ha Ji-won also got 230,000 followers on Weibo. CJ Entertainment says it expects "Sector 7" to continue with great results.